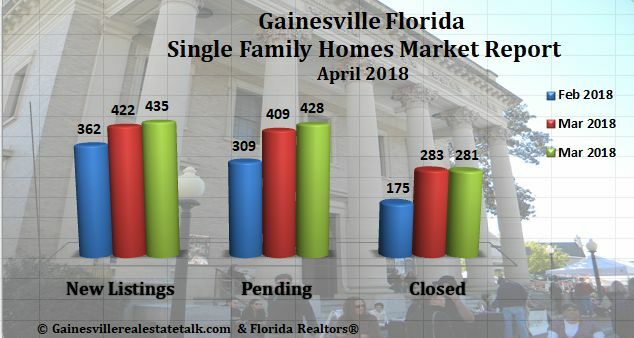 Gainesville Real Estate Market Report for Single Family Homes Sold in April 2018. Here you will find the recent three-month statistics for February, March & April of 2018. Our real estate market stats are here, and this shows we are swinging into the strong spring market. The chart below shows Gainesville’s market statistics for NEW LISTINGS, PENDING SALES, and the CLOSED SALES for the last 3 Months. New listings are up this month to 435! This is a strong jump up, and we hope the trend continues to ease our low inventory. Our new PENDING contracts are sitting at 428 homes. Closed Sales remain high at 281. The Gainesville-Alachua County Association of Realtors® provides their statistics to the Florida Realtors® each month and they compile statewide data that allows them to compile these reports. Let’s look at stats for April 2018 compared to the same month in 2017. Closed sales are had no change compared to last year. Yet our months supply of inventory has declined 14%, and this shows our low inventory of homes for sales under the $250K price range. Listings are selling faster, which is shown under medium time to sale or medium time to contract percentage. Median Sales Prices are steady. You can view the FULL Monthly Market Detail HERE. 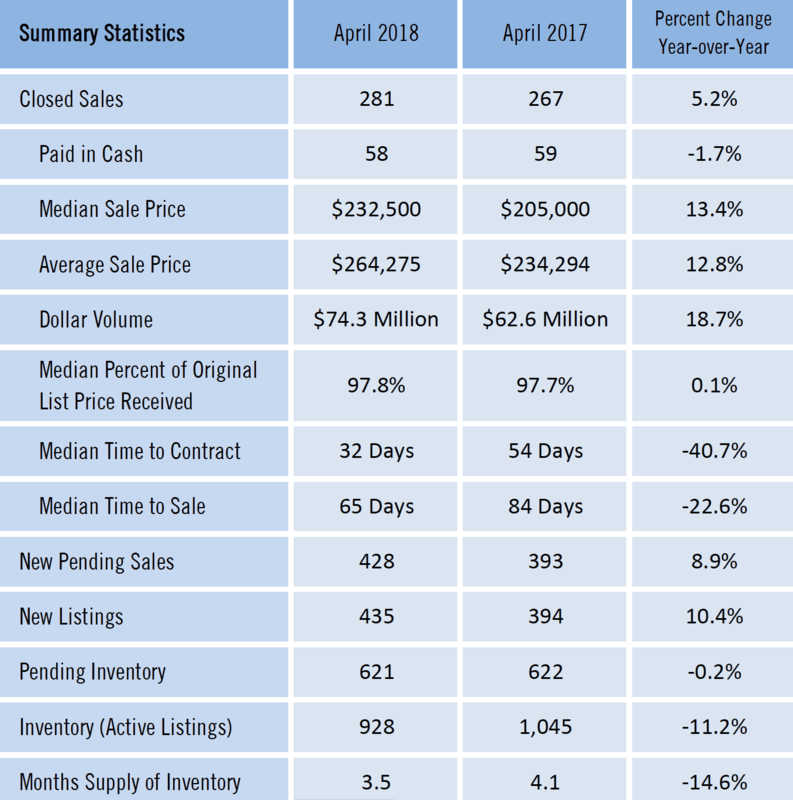 This chart above provides a detailed breakdown of the Gainesville FL Real Estate Market APRIL 2018. Our “Months Supply of Inventory” is down by 14.6%. This has already created multiple offer situations for buyers now for homes that are priced under $350,000. The average sale price is jumped up from last year by 12.8% and shows $264,275. To be a strong buyer, have your financing in place to make your offer strong. With interest rates heading up this year, there will be other buyers competing with you when looking at homes in Gainesville. Are you ready to start your home search in Gainesville FL? Please use our Advanced Search Feature to obtain current up-to-date information on the homes for sale in Gainesville. Each month we will publish Gainesville’s real estate statistics. This data is compiled by Florida Realtors® Research & Statistics division and is available after the 23rd of each month. Our monthly market reports help us understand Gainesville’s market condition. The Gainesville Real Estate Market great!